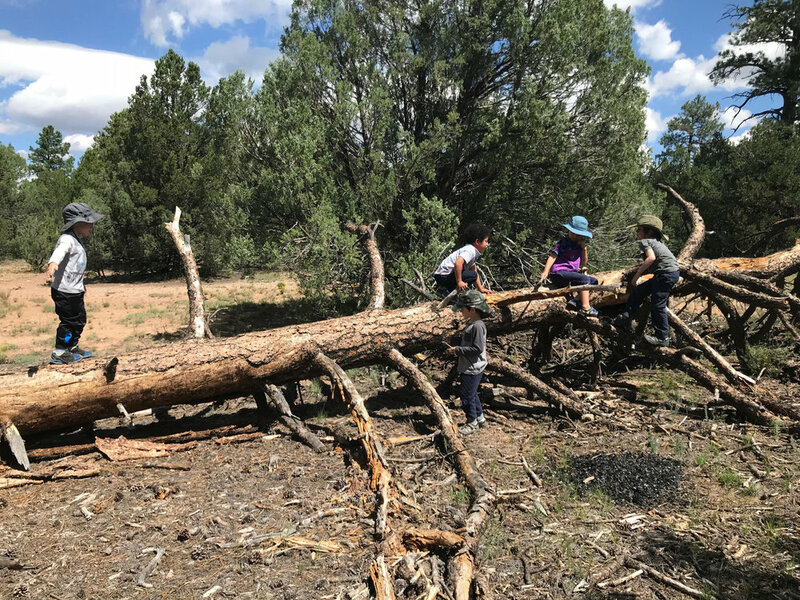 The Adventure Kindergarten Program incorporates two days of immersion at natural and cultural sites in and around Albuquerque, as well as a full day in the Bosque. This pioneering program enhances the organic learning provided by the outdoor classroom with the addition of immersive experiences at natural heritage sites, museums, and culturally-rich venues. As we travel by bus, we offer opportunities for direct engagement with our history and sensory immersion with our environment. At locales such as Tijeras Pueblo, the Albuquerque Museum of Art, the Maxwell Museum of Anthropology and others, the children, like young archaeologists, are able to follow their own inquiries, gather information and reflect on their findings. The emergent curriculum expands as we make multiple trips to a location and return-- as long and as deep as our curiosity leads. By exposing our children to a cultural panorama as well as extended time in nature, we empower them to make inquiries about human history and our planet. We hope this type of learning can positively influence their thoughts and actions as young children who will become stewards of our earth and citizens of an increasingly pluralistic society.